Do you remember reading stories about sailors’ first sightings of the Malabar coast: the evocative, rich scent of spices, green hills spreading back from the white sands and surf of the beaches? Kerala: a land that fascinates, there are beaches and back waters, ranging plantations full of scents, smells, romance, elephants and bison, chucked in with the odd roaming leopard or tiger. An abundance of wild birds and domestic ducks that waddle through rice paddies. Ayurveda at it’s best: healing combined with nature, the immense luxury and well being of a good massage! All of this, and then they have fully explored the potential of homestays with their plantation homes, riverside farms and mountain retreats. I have discovered some lovely places during my travels and introduce you to them here. The prices range from 3000 to 10000 rupees per night depending on season and location, so if they interest you call or mail me, most take guests by recommendation only. I can create for you a varied itinerary of Kerala discovery mixing and matching with some of these and the super luxury that exists too. The Whistling Thrush Bungalow at Nelliyampathy. In the midst of a rambling forest of a mixed plantation: coffee, cardamom, pepper, vanilla. All the scents associated with the old time ships that sailed to our Malabar coast. Nelliyampathy is the home of George and Anju Anthony and offers typical Kerala hospitality. You can wander and see the working of the plantation, see a host of amazing birdlife, sit and picnic and swim at the little dam on the property, follow the stream and maybe meet a bison. Hike upto the little church on the hill or relax in the garden and drink great coffee. Prices between Rs. 3500 to 8000. Tony and Anju also have a jewel of a small resort on the banks of the Wayanad lake: Kayaloram, unlike all the large fancy resorts across the lake from them, is a small 8/10 room place – a great restaurant – beautiful old rooms in traditional Kerala houses and an unsurpassed view of the lake. An ancient lady gives you a wonderful massage (maybe replaced by a younger one now.) You can also choose to take a cruise on their rice boat. It does not get much better. Prices between Rs. 5000 to 8000. The Old Courtyard Hotel on old Cochin Island, was a run down old home belonging to an old jewish lady that was converted by Jacob and Rose Kuruvinakunnel into a perfect little property – probably my best place to stay in Old Cochin. The courtyard with the mango tree and open air restaurant where they serve divine deserts and rather wonderful food is the perfect spot to sit on a warm lazy afternoon. The bustle of old cochin’s sea front is a short walk away as is the market. The rooms are individual and interestingly charming. As a gateway to Kerala it is the perfect start. The Farm at Mankotta Island,Kerala. A family home and working farm that accepts guests by reference only. Jai an ex Naval Officer and his wife Laila invite you into their home and their life on the River Pamba. You lie on a hammock in the courtyard and watch life float by on the river. The low ochre farm buildings have two guest rooms. The main house is an old Kerala home with a steep pitched roof and rambling bougainvillea. Of an evening Jai Chako will invite you to share a drink and regale you with anecdotes from his planters chair on the verandah. The food is home grown and cooked, very delectable. You can explore the farm, visit the nearby village temple, swim in the river and lie under the coconuts to dream. Hill House is situated at Kuttikanam. Set in the Ghats, a five minute drive from the main Kottayam Kumily road, built on a 600 acre estate where tea, coffee, cardamom and other spices are grown. A unique house built entirely from salvaged wood from old buildings that are indiscriminately torn down, overlooking spectacular views of the valley spread before it. It is a place of peace and serenity, you can choose to do some strenuous or leisurely treks, there are scenic walks on the estate. 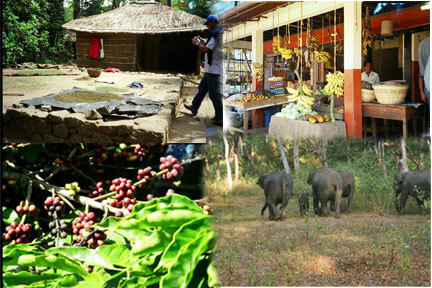 Visits are arranged to nearby Ayurveda and Spice factories that are run by a local NGO. Thekkady and the Periyar Game Sanctuary are approximately 40 kms away. Guests have an opportunity to see a working estate, a cook and maid are on hand to look after you, your hostess and her family live a five minute walk away and are on hand for advice about activities and also welcome you into their family. This is inclusive of full board. Please note that all prices quoted are to give you an idea, exact prices will be available on booking depending on time of year and availability.